Do you understand what sort of Data Visualisation you need? Over the past ten years, there has been a rapid and widespread growth in the use of data visualisation. However, this growth has resulted in wide diversity in the quality and usefulness of the visualisations being used. Visualisation helps if it meets the needs of the creator and audience, and for that to happen the needs must be clearly understood. This post looks at six different needs and maps them to different visualisation approaches. To help find the story in the data, as part of the analysis process. To present a recommendation or interpretation. To explain/illustrate a concept or idea. To help other people explore information. As an instruction or teaching aid. In the sections below, I will take each of these needs in turn and outline the implications for the sorts of visualisation you might want to use. Speed You want to be able to move through lots of iterations to find the views that help you interpret the data. Flexibility In order to explore data you will play around with the data. For example, you want to be able to change the variables (including the number of variables and transformations you might be applying to them), you want to be able to move and rotate the image, and you want to be able to hide or enlarge parts of the chart. Integration Your visualisation package/system needs to be integrated with your analysis software. In order to achieve speed and flexibility, you do not want to be cutting and pasting data from your analysis package to a visualisation package. This might mean your visualisation package has good analysis options, or your analysis package has good visualisation tools, or there is a deep/integrated link between your data analysis package and your visualisation package. A simple example of a ‘finding the story’ sort of visualisation is a radar chart. Although a few end users are familiar with these charts and like them, most end users do not find them helpful. But radar charts can be a convenient way for you to see patterns in the data. The radar chart below (click on it to englarge it) is based on a 2017 study by NewMR, benchmarking the state of market research knowledge. The chart shows the percentage of researchers familiar with a range of market research-related terms – comparing Japan with the Global picture. When I first accessed the data, it was in questionnaire order. After creating the radar chart (in Excel on this occasion), I was able to sort the data in Excel by the Global sample and then by the Japanese sample, to view the emerging patterns and information. I also added and deleted other countries and looked at the data as bar charts and line charts – this is what I mean by speed and flexibility, in the space of 5-10 minutes I looked at three types of chart, with different countries, sorted by different criteria. Clear and intuitive – the audience should not have to be shown how to read the chart, the message should jump off the page. Have a single interpretation – the audience are not being offered a variety of ways of utilising the visualisation, the visualisation tells the same story as your voice and any text you are using. The chart below (click on it to enlarge it) is based on the 2017 NewMR benchmarking study. The chart shows the percentage of Japanese researchers who attended a training session or workshop in 2017 – the chart was created with Vizzlo. The chart could have shown how many people attended 1 session, 2 to 4 sessions, 5 to 9 sessions, or 10 plus sessions. However, that is not the story this chart tells. 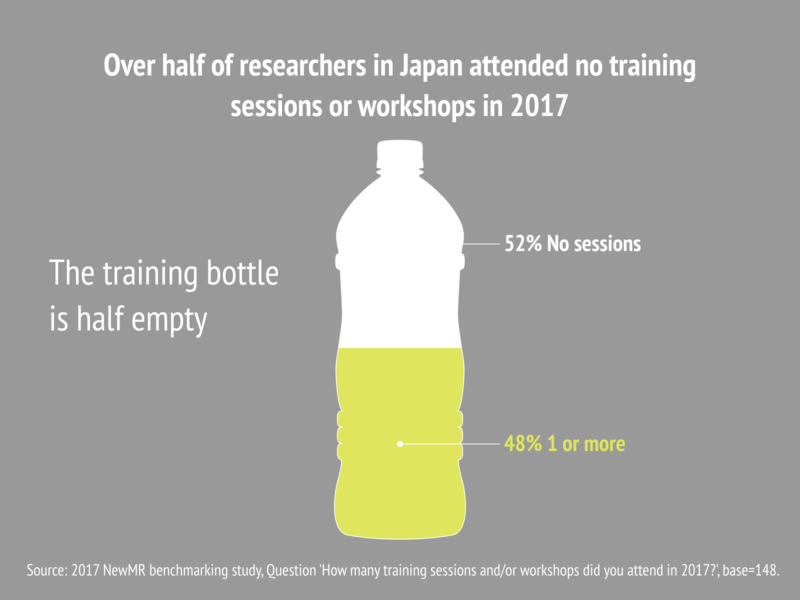 The story this chart tells is that about half of Japanese researchers did not attend a training session or workshop in 2017 – and the recommendation we were making was that in the future, more researchers should attend training or workshop sessions. Note, I have created this chart in Excel, because I am not a designer. 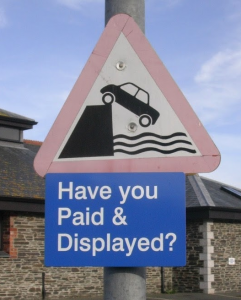 But when time and budget permit, this sort of graphic is often best produced by a designer, using graphics software or at least advanced visualisation software. Unlike visualisation for analysis, these sorts of charts do not need to be dynamically linked to the data (otherwise the message might change), they do not have to be hyper fast to produce, and their focus is everybody (whereas with analysis visualisation the focus is the analysis). The previous need was the narrow one of presenting a recommendation, but a wider need for visualisation in presentations and reports is to help explain something, so that the audience understands the point you are making and the reasons that underpin that point. It should be easy to explain to the target group, it does not have to be immediately intuitive, but you do not want it to be difficult to understand – after all, the visualisation is intended to illustrate the point, not obscure it. It should not depend on numbers. It is fine for a chart like this to show numbers, but the interpretation should be possible from the visual elements alone. Interactive visualisations can be problematic for this purpose, as they can be too open-ended or distracting. But animated presentations (such as a video or an animated sequence from a presentation package) can be a powerful form of visualisation for this sort of explanation. The chart below (click on it to enlarge it) is from a post by Tim Bock of DisplayR and shows Internet browser usage data. 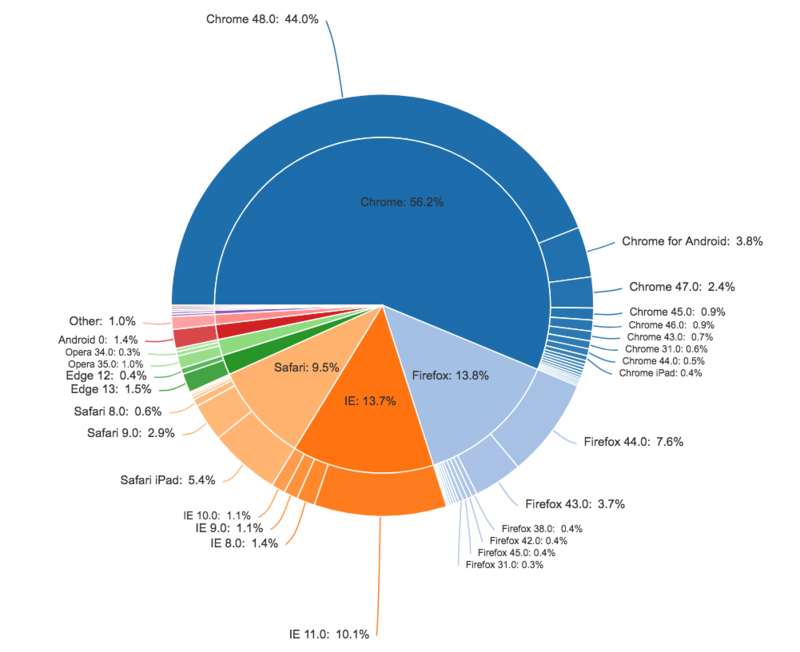 That Firefox, IE, and Safari are about the same size as each other, and between them amount to about one-third of all usage. That for all four leading browsers, more than half of their users are using the latest version. But, for all the browsers there are many people using older (in some cases much older) versions. Unlike the previous cases, with this type of visualisation you are facilitating the reader to discover things for themselves. This type of visualisation is more often used in formats that are not face-to-face, and where the user of the visualisation has time to explore the data. Examples of this type of usage include reports and freestanding visualisations. Easy to understand The visualisation does not have to be immediately intuitive, but it should not be difficult to understand – after all, the visualisation is intended to illuminate the data, not obscure it. Data availability In an ideal world, the user should be able to access the underlying information or data. In particular, you do not want to force people to re-type information from your visualisation into their analysis. Interactive visualisations can be a great way of helping somebody explore the data. Check out this link to GapMinder, to see a good example of how interactive visualisation can help the user explore the data. 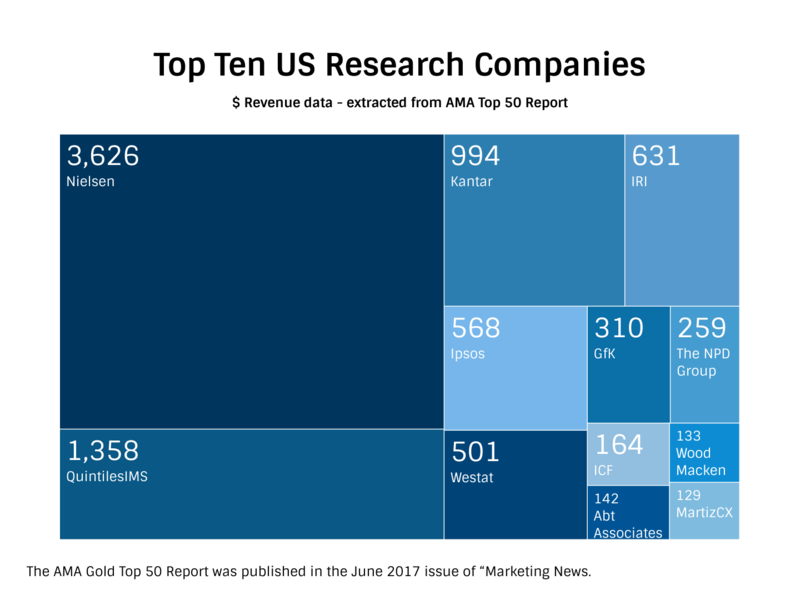 The chart below (click on it to enlarge it) is a tree map (created by using Vizzlo) that shows the ten largest research agencies in the USA in 2016, reported by the AMA in 2017. The immediate impact of the visualisation is that Nielsen is much larger than the rest – and if that was the only message we wanted to share we would not have shown the other agencies as separate boxes. However, the benefit of this chart is that it allows the reader to investigate other issues, for example, comparing Ipsos with GfK, or QuintilesIMS with IRI. Some software packages can help with analysis and produce this sort of output, but in other cases, graphics software will be used to produce these sorts of images. Some visualisations are art as well as being informative, for example, many of the visualisation created by David McCandless. One key growth area within many types of organisations (including agencies, end-clients, and suppliers of research software and services) is in the employment of designers – and I would expect this trend to continue. Visualisation can also be more about art than the communication of information, for an interesting example check out this deconstruction of David Bowie’s Space Oddity. Data as art does not normally depend on having good data tools, it depends on having somebody with the aptitude to create art, and they will typically use the tools they feel most comfortable with, which for some includes drawing, sculpting etc. This sort of need can be based on data, but it can also refer to a broader set of ideas and concepts that you want to share and which can be made simpler with the aid of visualisation. 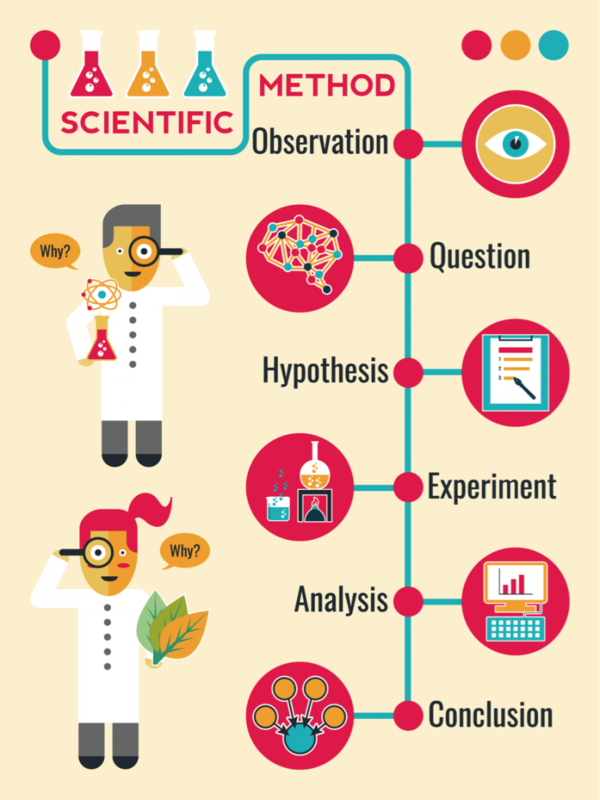 For example, the visualisation (purchased from iStockPhoto) below illustrates the scientific method. The visualisation needs to be accessible to the audience, but in a teaching situation, you may also be teaching how to use this sort of visualisation. As well as static images, animation and interaction can be a useful part of training/teaching. One of the key rules of creating evidenced-based stories that result in action is to understand that there is not necessarily any link between how you found the story and how you should best tell the story. The needs of each situation should be identified and the most appropriate method adopted. Want to read more about visualisation? NewMR and Ray Poynter will be publishing a number of posts on this topic, you can make sure you never miss them by signing up to Ray’s NewMR Newsletter, just click here to sign up. How does this outline look to you? Have I missed some key items? Do you disagree with some of my points? Are there other great examples you’d like to share?